September 28, 2016 11:11 ET | Source: Venstar, Inc.
CHATSWORTH, CA--(Marketwired - September 28, 2016) - Venstar® today announced its new Wireless Temperature Sensor for ColorTouch® and Voyager® Wi-Fi® residential and commercial thermostats. Venstar's Wireless Temperature Sensor (Model ACC-TSENWIFI) can be used as a remote sensor or to measure the temperature of the outdoor, supply or return air. The Wireless Temperature Sensor can enable averaging of air temperatures across the entire location for a more comfortable, energy-efficient environment. It also facilitates alerts if equipment is not cooling or heating properly. 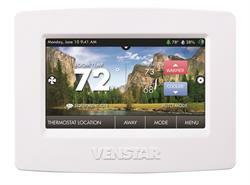 "Venstar's new Wireless Temperature Sensor was designed to help improve the indoor comfort of homes and businesses. When used as a supply air sensor and installed with the included duct sensor, it alerts both the owner and the installer when the HVAC equipment is not working as it should, so it can be resolved before energy costs skyrocket," said Steve Dushane, president and CEO of Venstar Inc. "It also saves the installer time and is easy to install coupled with the Configurator App," Dushane added. 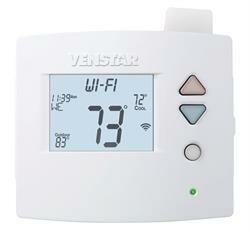 Venstar's Wireless Temperature Sensor can be used indoors or outdoors using the on-board sensor or an external sensor. For added flexibility, the wireless sensor also ships with an external duct sensor. When Supply Air Alert is enabled, alerts are sent to the user and/or contractor's mobile device using Venstar's free Skyport™ Mobile App. Maintaining a consistent air temperature across multiple rooms can be a challenge for both residential and commercial users. Utilizing the Wireless Temperature Sensor in a remote room will provide information to the thermostat that may be averaged with the thermostat or additional wireless sensors for a comfortable temperature throughout the entire location. Venstar's Wireless Temperature Sensor may help balance temperature in multi-story buildings, such as two-story homes or offices where the only thermostat is located downstairs. In a restaurant, the Wireless Temperature Sensor can be installed in the dining room, where the customers are, to help balance the heat of the kitchen, where most thermostats are installed. When there are multiple commercial HVAC units on a rooftop, it can be difficult to determine which if any of them may be malfunctioning as the space temperature may be within the pre-set limits. However, one unit could possibly be blowing hot air, making the other units work harder to reach the desired temperature, which greatly increases energy usage. Utilizing the wireless supply air sensor on residential and commercial units will alert users and contractors if the temperature of the air being supplied is outside of expected limits. For multi-location stores or restaurants, the Wireless Temperature Sensors alert the owner or contractor when air temperatures are outside of pre-set limits for all of their locations, reducing the need for them to visit individual locations. Automatic alerts advise when equipment is not cooling or heating properly so issues can quickly be addressed and resolved. In the winter, dual fuel residential systems operate as a heat pump, so gas heating is not needed during mildly cold days. However, if the outside temperature drops below ~28 degrees, the system may have to use a fossil fuel source to heat the air. Utilizing a Wireless Temperature Sensor to gauge the outside temperature will tell the system when to turn on and off the dual fuel, reducing gas usage and helping to lower energy bills where fossil fuels cost more than electricity. For larger installations, such as commercial facilities, up to 20 sensors can be used per network. They can be set up to work individually or together for a consistent, average temperature. Sensors may be powered by 24vac power or four AA batteries, which deliver an average battery life of about one year for the indoor temperatures or two years for outdoor temperatures. Venstar's Wireless Temperature Sensor is compatible with Venstar's Skyport Supply Air Alert feature, which sends an email alert when the supply air has not reached the desired temperature in the allotted time. This notification enables the designated party, whether it's the thermostat owner or contractor, to be notified of the system's operating inefficiency in order to detect potential equipment failures. Venstar offers six models of its ColorTouch programmable touch screen thermostats: three for residential use and three for commercial use. All of the models have a multi-functional, simple-to-use, graphic touch screen. The color touch screen can be programmed to display a picture gallery of up to 100 photos to be used as a slideshow. Select models offer Wi-Fi inside for remote monitoring and control using Venstar's Skyport mobile app. Select models also include humidity control, which can utilize information from the Wireless Temperature Sensor. ColorTouch thermostats are compatible with virtually every type of commercial heating and air conditioning system and are compatible with smart home automation solutions, including Amazon Echo/Alexa. Venstar offers seven models of its affordable, fully featured programmable Voyager thermostat: three commercial, three residential and one that is designed for school environments. Designed for ease of use, Voyager thermostats feature large, easy-to-read displays with easy setup and controls. Voyager thermostats feature "Simple as You Want" operation with a choice of programming options. Select models also include the ability to control or monitor a second temperature sensor, control humidification/dehumidification and include Energy Watch functionality. The top-of-the-line commercial model also features a light sensor to determine occupancy and if the lights are left on. Optional wireless modules include Wi-Fi, ZigBee and Z-Wave, making Voyager the most flexible and affordable thermostat solution for automation and the Internet of Things. Voyager thermostats are compatible with virtually every type of commercial heating and air conditioning system. For additional integrations, Venstar's Application Programming Interface (API) enables developers and hobby programmers to integrate the thermostats with other third-party systems, including most home automation systems. Founded in 1992, Venstar Inc. is a leading thermostat and energy management system (EMS) manufacturer, known for providing value to its customers via ease of use and installation, proven cost savings, improved energy efficiency, quality and reliability. 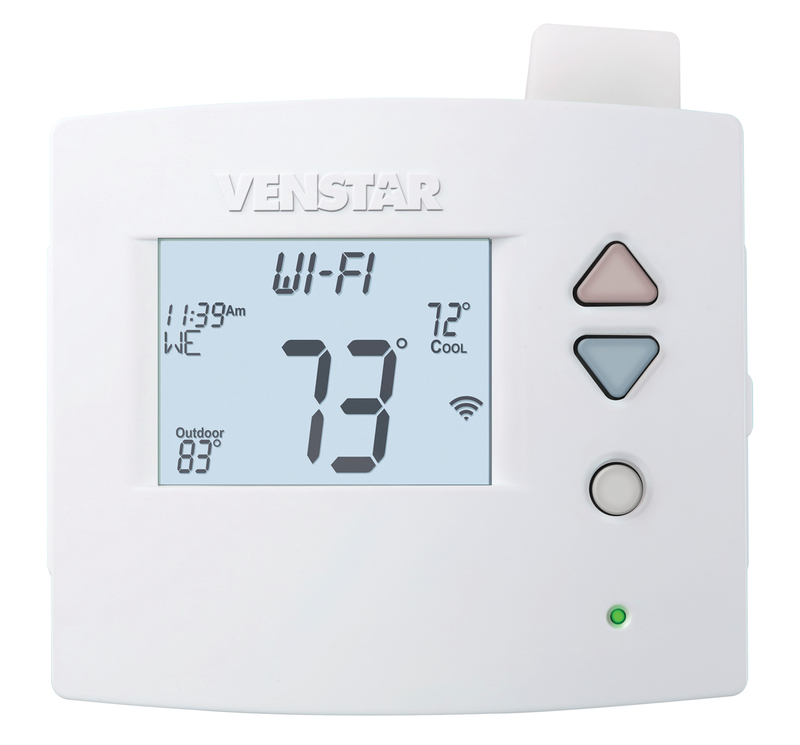 Venstar is one of the largest thermostat suppliers in the world and designs and produces Venstar-branded products as well as OEM thermostat products for the biggest names in HVAC. Venstar's Surveyor is a leading energy management system, typically saving small-box retailers 20 percent-35 percent of their energy costs, which translates to tens of millions of dollars in savings each year and dramatic reductions in CO2 emissions. Surveyor currently controls the energy usage of 24,000+ retail locations across the United States, Canada, Puerto Rico and Mexico.